Simple, capable, and user-friendly. The Backland Tour Binding has a combination of features that folks have been eager to see for a long time. Hauling around excess weight in an overly complicated binding isn’t anybody’s favorite activity, and Atomic is here to simplify things. The toe piece screams "work smarter, not harder", utilizing a long lever to increase leverage during transitions. 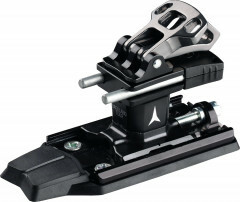 Naturally it offers the efficiency of a tech binding on the uphill. Socket-clearing toe pins help clear out ice and debris. A patented step-in aid helps guide the boot into the binding. 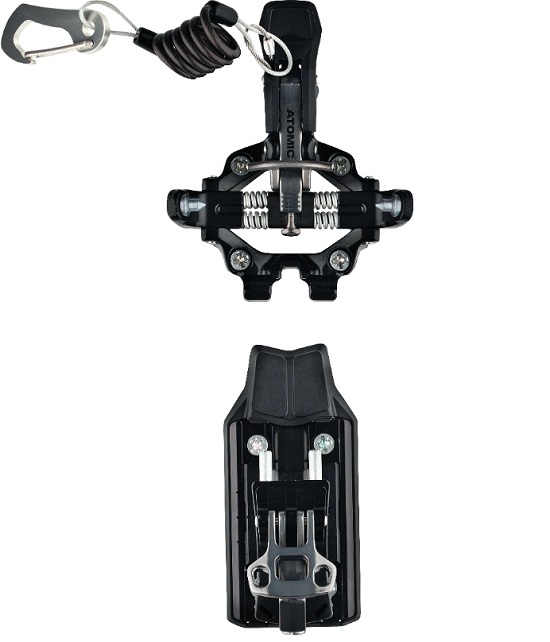 An integrated Dynafit-style crampon receptor minimizes additional parts to lose, break, or buy. In a word: perfect. The heel piece sits on a threaded adjustment track to accommodate multiple boots so your jealous friends can take a spin. Turn the heel piece 90° for a flat mode to make long approaches friendlier. Two risers flip down so no-matter the terrain, you’ll be at an efficient climbing angle. Best of all, you have your choice of three release settings by means of a spring swap. Simply unscrew the spring cartridge and replace with the men’s, women’s, or expert springs included in the box. This uniquely changes both the lateral and vertical release values. 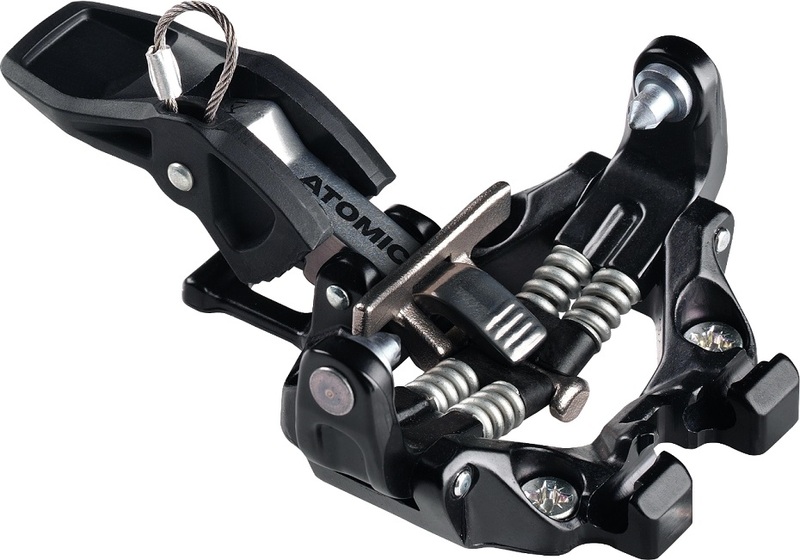 The Atomic Backland Tour is a capable binding that suits just about every backcountry skier’s fancy. Includes three different lateral & vertical release springs: men’s, women’s, and expert. Patented Step-In Aid makes enables you to put your skis on with your eyes closed. Three total riser heights include a flat mode and two beautifully machined lifters. A 30mm adjustment track accommodates your beef boot and your race boot. The leash (+28g) can be used to measure the heel gap for in-the-field adjustment. If you decide to add brakes later, you can. Alternately, buy them together at a discount. Hi Al T, while we do not have spare springs available for sale, you can check to see which spring is on your bindings by looking on the underside. It will say Men, Women, or Exp depending on which spring is installed. You can get away with using a 4mm hex wrench with one flat side against he binding and the other flat side against the boot for a gap tool. These bindings have provided me with absolutely 100% reliable retention over hard, chunky, icy conditions, and when bending even stiff fat skis at high edge angles. I am 5'7" 170lbs and have a pair mounted to a 177cm 95 underfoot ski, and another pair mounted to a 184cm 118 underfoot ski. Unless in absolutely severe consequence terrain, I ski with the toe pieces in ski mode and use the Men's rear spring. I have never pre-released from either toe or heel. The binding also comes with a lighter "woman's" spring and a heavier "advanced" spring which are simple to swap. I greatly value the low ramp angle between the toe and heel pieces of this binding for my style of skiing. Ice-buildup under the toe piece is extremely rare, and cleared in mere seconds by simply moving the lever into walk mode once or twice. Heel piece is easy to rotate with skis on, and rotates independent from the risers; which are themselves easy to flip with a ski pole. Are mounting screws (the entire set) available for purchase for these bindings? Thanks. Hi Michael, I've just checked and Dynafit 12.5mm torx screws will work as direct replacements for this binding. Love these bindings! Have over 30 days so far on it and the identical Salomon version. They have everything you need in an all-purpose, day-in day-out ski touring binding: light, very user friendly, good retention, and (so far) durable. I’m a somewhat 190 pound aggressive skier and have been using the “man” spring and the retention has been good. If I’m touring in soft snow I can tour with the toe unlocked. You can easily rotate the heel piece from tour to ski mode with a push from a pole grip, or leave the pins forward and cover with the heel riser if there’s no need for a flat mode. They have a nice low ramp angle that can be further reduced by omitting the plastic heel plate. Highly recommended! As I understand it, to add the brake one needs to remove the heel piece, replace the bottom plate with the one that comes with the brake and put the new heel piece on. So I have the idea of using quiver killers to make it easy to remove and reinstall the heel piece whenever you want to. Any reason that would not work? And you could guys install things for me that way? Yep! You got it. The version that ships with brakes comes with a brake-less base plate. No reason that quiver killers wouldn't work. A few minutes ago we debuted our Atomic Backland Quiver Killer Kit and our tech Eric would love to install them for you! Pricing on installation is here. Oh, cool! So I don't have to buy the brakeless version + brake. Does the with-brakes version also come with the rather nice leash, which doubles as a heel-gap checker? Hi Eric, unfortunately the braked version does not come with the leashes. We plan on making those available separately, but we don't have them yet. Note they are on the expensive side when sold separately. The leashes are 4mm thick, kind of heavy at 25 gm each. They also can be used to set the 4mm gap between heel of your boot and the binding, for proper function. I will replace mine with the ATK leashes at some point. I picked up a set of the Salomon MTN binding in France in March. Now mounted on my Backland 95 skis.